More than 9,000 pilgrims have flown to Saudi Arabia through more than 25 flights in the Pakistan International Airlines (PIA)’s pre-Haj operation. 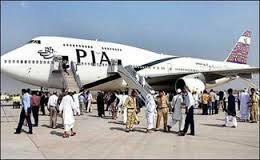 PIA Managing Director Shahnawaz Rehman, while talking to a private television channel said that all flights are leaving on schedule and Boeing 777s and 747s are taking part in the operation. He added that more than 1400 pilgrims will be sent via four special flights from Karachi, Islamabad, Lahore and Quetta on Wednesday. Shahbaz Ahmad, Senior Country Manager of PIA in Saudi Arabia, has said that Saudi government has allotted additional parking to the national airliner for the Hajj Operation. He added that the scouts and volunteers in Medina and Jeddah will guide the pilgrims to the camps.